The largest shipment of deadly plutonium in history is about to leave the French port of Cherbourg - final destination Japan. We've taken action to send the message that this is yet another glaring example of the unacceptable risks posed by nuclear energy. Greenpeace activists in France have tracked the shipment which contains 1...8 tons of plutonium in Mixed-Oxide (MOX) fuel. This is enough to make 225 nuclear weapons, each more powerful than the bomb that devastated Nagasaki. We've demonstrated with distress flares and "Stop Plutonium" banners at the Cherbourg port. We projected a "target" symbol and "Nuclear Madness made in France" onto the nearby state owned AREVA reprocessing plant in La Hague, where the MOX was produced. Our activists also projected the same messages onto the trucks carrying the deadly cargo to Cherbourg. Two ships, the Pacific Heron and Pacific Pintail will be used to transport the radioactive cargo. They will leave on March 6, just after departure AREVA will reveal which route the deadly waste will take to Japan. One of the biggest dangers of plutonium is that it can be used to make nuclear weapons. MOX increases the dangers of nuclear proliferation, as the plutonium in it is easier to extract for weapons use than plutonium in spent nuclear fuel. There is also plenty of evidence showing that the containers used to transport the MOX are not strong enough to withstand serious accidents or terrorist attack. Risk of fire is just one example, the containers are only tested over a few hours, but fires on board ships can last much longer (days or even weeks). Once MOX fuel disperses it poses a grave threat to public health and the environment. Referring to a plutonium shipment in 2002, the Government of Antigua and Barbuda stated "our small states are fearful that a deliberate act of terror aimed at those ships may bring an end to our very existence. This is not fanciful or farfetched fiction." Considering all this, it is little wonder that plutonium and MOX shipments have been opposed by dozens of governments and their citizens, since they started. AREVA denies that there is any proliferation risk by claiming a false distinction between "military grade" and "civil grade" nuclear material. The International Atomic Energy Agency (IAEA) thinks differently classifying commercial plutonium MOX fuel as Category 1 nuclear material, requiring the highest level of security protection. In fact, the world now has more weapons usable plutonium in civil nuclear programmes than in all nuclear weapons arsenals. Along with the Japan's Citizens Nuclear Information Center and Green Action organisations we've written to Mohammed ElBaradei, head of the IAEA warning him that AREVA is either dangerously confused, or is deliberately misrepresenting the proliferation threat posed by the fuel. We've also sent letters to the governments of countries that may be en route, warning them of the potential dangers to their populations and environment; and urging them to take a stand. 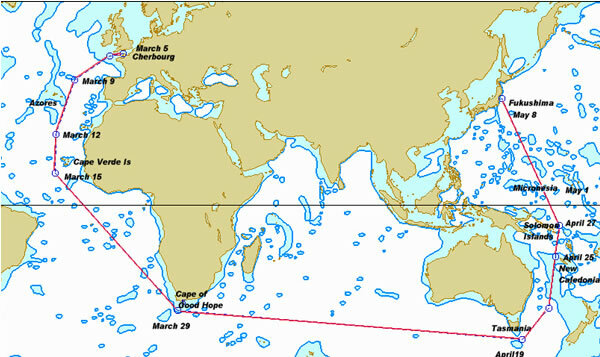 The most likely route of the MOX shipment is via South Africa and across the Tasman Sea between New Zealand and Australia, and through the coastal waters of South Pacific nations. Other possible routes are via the Caribbean and Panama Canal or via South America and Cape Horn. Japan has been trying to use MOX in their nuclear reactors for more than ten years; and have repeatedly failed. The first shipment to Japan in 1999 ended in fiasco after the producer, UK state company British Nuclear Fuels, admitted it had deliberately falsified vital quality control safety data. After an 18,000-mile voyage, the rejected fuel was shipped back to the UK. Two more cargoes, one delivered in 1999, the other in 2001, were opposed by local citizens and regional governments. Both shipments remain in storage with no prospect that they will ever be used. Enough already, stop the Nuclear madness! It's not as though anything has changed. Shipping MOX remains as dangerous as ever. Governments across the world have recognised the threat and in 2005 a moratorium on all nuclear transports was tabled at a UN summit. It's time to make that resolution a reality. Despite the best efforts of the nuclear industry to convince us otherwise, the simple truth is that you can't separate "civil" nuclear from nuclear used for weapons. They are two parts of the same extremely dangerous whole. As for industry claims that nuclear power can be used in the fight against climate change, the opposite is true. Nuclear power is too little, too late, too dangerous. In fact, it undermines the true solutions to climate change by diverting urgently needed resources away from renewable energy and energy efficiency. We will be following the MOX shipment on our nuclear reaction blog, sign up for updates.